The CFI-6039 enables you to build a NAS-system (eg. with FreeNAS) on Mini-ITX basis. 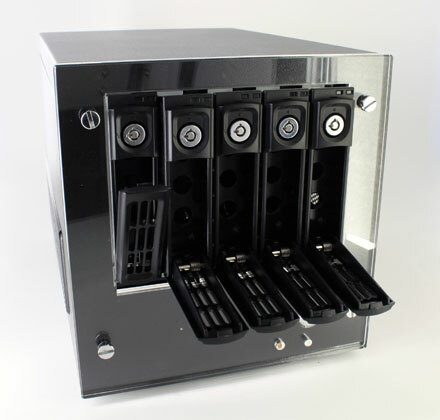 The enclosure offers 5x Hot-Plug SATA 3.5" drive bays. The internal 300W PSU offers enough power and the free PCI-slot on the rear side allows further expansion. Der Powersupply-Lüfter ist unmöglich laut. Was wird mit den 4 SATa Powerstecker bezweckt? Die Laufwerke werden über die Rückwand versorgt. Da hat sich keiner was dabei gedacht!!! Mounting-adapter SSD/HDD 2.5" to 3.5"
CFI A-7879 / A-78x6CM extra tray 3.5"